Last month, a strange little project launched online. 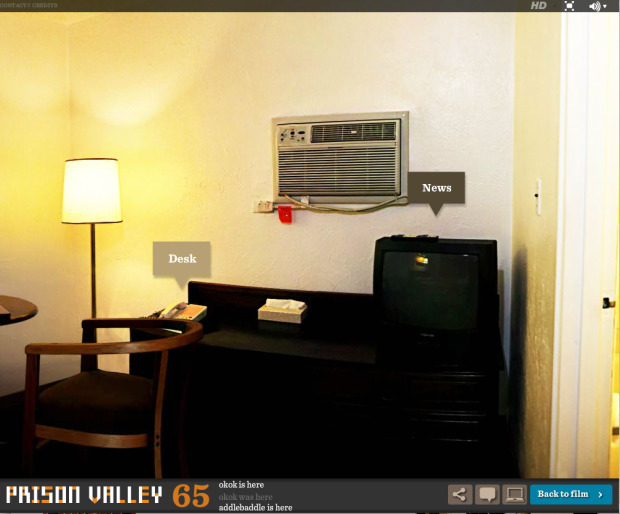 Prison Valley is an interactive, Web-based documentary with its own iPhone app, and a heavy social media presence. It’s been produced in three languages, by two French guys with a little help from the the Franco-German arts channel Arte. What’s odd about this project is that, instead of the TV documentary being the focal point and using the Web as a promotional tool, it’s the other way round. The premise of Prison Valley, which took 16 months to complete, is about a town in Colorado called Canon City. 36,000 residents, 13 prisons. The crew spent time in the town, interviewing the people who live and work there, and documenting what the voiceover calls “the clean version of hell.” The town has grown up around the prisons. “If the prisons weren’t here, there would be nothing and nobody, because there is nothing else to offer.” Gritty stuff. After a four-minute introduction, the $300,000 project gets interactive. Viewers register via Facebook or Twitter, and watch the documentary, pausing every couple of minutes to check out additional footage and information. There’s a forum for the community to share opinions of the show, and a blog where this afternoon (Thursday), French Secretary of State for Justice, Jean-Marie Bockel, is doing a live chat. Thanks to the member profiles, the Web site remembers the last bit you watched, so there’s no need to go back to the beginning and search for where you left off. By the time the project comes to a close, it will have spawned a Web documentary, a TV documentary, a book, an iPhone app and even an exhibition in Paris next month. The Web site Innovative Interactivity has an in-depth interview with Dufresne on the technical details of making Prison Valley.